You are normally an active person who has been forced to sit it out for quite some time thanks to an injury? Are you going stir crazy as you watch others around you getting active? Desperate to get back at it yourself? Obviously, you can’t rush back in full speed ahead and go all in after an injury. You risk re-injuring yourself or making the current injury much worse. Instead, you need to go about things in a more cautious and planned manner. So, how can you start to get back on track and restart your fitness after an injury? Well, there are a number of steps you can take, as we will discuss in this handy guide. Before you start to do any sort of physical activity or working out, it’s always recommended that you speak to your doctor first. Ask them if it’s okay to restart your fitness after an injury, and if so, what are the physical limitations that you should be aware of? It is not just your doctor that you should speak to; you may also have a physical therapist who you has been helping you to recover. Get their input too. The more help you can get from these professionals, the better it will be for you. As you start to ease back into things, it’s also important that you are very aware of what your body is telling you. Not listening to your body’s limits may have actually led to the injury in the first place. This time around, you want to be smart and reactive so that you don’t find yourself in the same position. Taking things slowly can also help to prevent further injuries from occurring. Recovery isn’t going to happen overnight. In most cases, you will find it very slow. It’s important you are patient during this time and understand that this is normal. Yes, it does take a long time. It’s better to start out small, with just a few exercises each time. Then build up over the course of days and weeks. As to how much effort you should be putting in, experts recommend you start out at about 50% of what you would consider your normal level of activity. From there, you can increase by about 10% each week as long as the increase isn’t causing pain and problems. Obviously, a little pain isn’t anything much to worry about. However, if you’re experiencing sharp pains and consistent strong pain, it’s time to reel it in and slow right down. Once you get into the groove of working out again, you may be tempted to do it on a daily basis. While that may have been fine before your injury, post-injury rest days are extremely important. It is wise to take anywhere from one to three days off before you are active again. 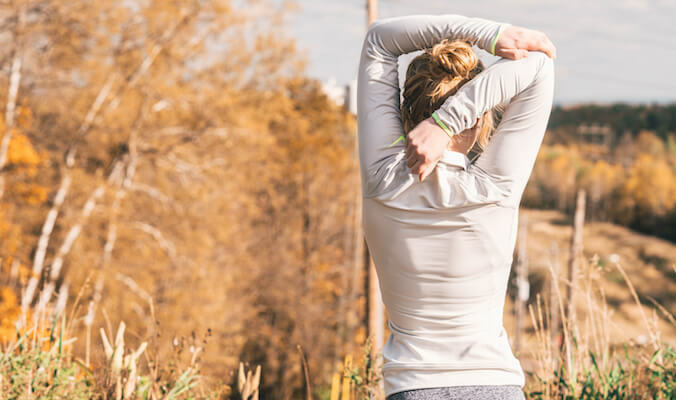 Whether this is a rule you followed before your injury or not, stretches should be an essential part in any physical activity. Taking the time to stretch out your muscles before you work out will help to get them loose. It helps to encourage blood flow, and warm them up. You will also want to perform some cool down stretches at the end of your workout. When it comes to the activities you should and shouldn’t do, chances are that you will want to steer clear of any high impact activities. Instead, look for low impact exercises that allow you to set the pace. Hiking is an excellent example of an exercise that will get you out there and get you active. It’s not high impact causing stress on your muscles and bones. You can choose where you hike, how long you hike for, the type of terrain, and the speed at which you hike. If you’re new to hiking make sure to check out hiking tips for beginners that will give you the foundation to get started in a safe manner. Tips such as staying hydrated, packing a compass and map, when to take breaks, traveling with an experienced partner, bringing food, and more will all be covered. These tips can help you to avoid injuries and other issues. By using these various tips, you will be able to restart your fitness after an injury in a safe and effective manner. Allowing you to get back to full capacity without suffering any sort of set-back.